If you haven’t cottoned on to the power of pedaling you’re missing out. There is ample evidence highlighting how those who jump into the saddle are on to a winner. Research shows that powering through just three cycle workouts a week can do wonders for your fitness. After just eight weeks of regular cycle workouts exercisers enjoyed improved cardio fitness, reduced body fat, and decreased blood pressure and cholesterol levels. Researchers believe the varying levels of intensity within each workout are an important factor in maximizing muscle adaptations and producing comprehensive health benefits. RPM is based on the science of Cardio Peak Training, which combines the cardio endurance of steady-state training and the transformative fat burning benefits of high-intensity interval training (HIIT). There are plenty of studies highlighting how high-intensity interval training drives muscle activation and fat burning capacity – even after you’ve stopped working out. But most of these studies are based on conventional weight-bearing HIIT exercises such as burpees, squat jumps and lunges. A recent study has shown that high-intensity interval cycling can be a great low-impact way to enjoy the transformative results of HIIT. Study participants added just two 30-minute LES MILLS SPRINT™ workouts to their weekly regime and significantly improved cardiovascular, metabolic and musculoskeletal fitness. They also reduced body fat mass and blood pressure, while enhancing glucose tolerance and strength. Regular cycling doesn’t just result in toned and shapely legs, research shows that cycling can be a great way to reduce your waistline too. Exercisers who did RPM three times a week over an eight week period managed to cut an average of three centimetres from their waistline – and they reduced their body fat by 13.6 percent. Forget pills and potions, new research indicates that pedal power could be the perfect youth elixir. In a study of 125 amateur cyclists, researchers found they maintained consistent levels of muscle mass and strength, and stable amounts of body fat and cholesterol, as they aged. The cyclists reduced the risk of heart disease, diabetes and cancer, and their production of disease-combating T-cells was still functioning as well as much younger people. 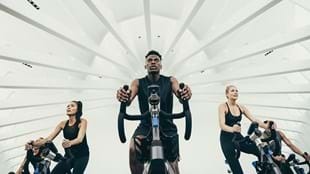 You can enjoy the many and varied benefits of indoor cycling by trying a LES MILLS SPRINT or RPM workout at club near you working out On Demand. For the ultimate fully immersive cycle experience discover THE TRIP.